So last week I shared a bit about my experience at ALA. Here is the rest of the dirt. This time no pictures of me (possibly), just fawning over famous-er and hugely (brilliantly) talented people (and therefore this post will get lots of hits). 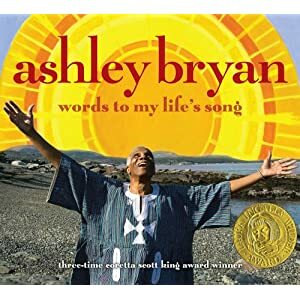 The charming, enchanting and legendary Ashley Bryan, signing his book 'Word's to My Life's Song'. If you haven't read it yet, GO get it. And then I got to sign my book for Ashley when he dropped by Charlesbridge Booth! A-MAZ-ING. A hug from Mr. Bryan can keep you warm and inspired a long time, let me tell you. LUUURRRRVVV this drawing he did!!! And I found Toni Buzzeo again (Stay Close to Mama) on Disney-Hyperion .. another title to look out for. Maine authors and illustrators are SO PROLIFIC! (Just saying). (A Warmer World, pub by Charlesbridge illustrated by MAINE's Jamie Hogan). That is 'MAINE'. Christina Forshay, a Facebook friend come to life on Albert Whitman's booth! The incredible Jon Sciezka ... handsome as ever. trying on a stretch hummer for size. I like it! Whose signing line do you think this belongs to? Clue - not me. It went for miles and to Hawaii for all I know. Yes it was for the zany Lemony Snicket, signing at Little, Brown. And now CAKE CAKE CAKE! Let them eat CAKE! Mr Ashley Bryan was kind enough to invite me along to Simon and Schuster's 'Celebration of the Picture Book' Dessert Party in the evening. Oh - cake, how I love you. But I really didn't eat too much ... REALLY. Even more awesome than all those cakes was the guest speaker at the celebration. None other than William Joyce (The Fantastic Flying Books of Mr Morris Lessmore, Rolie Polie Olie, Toy Story ...). It was an honour to listen to him and hear how The Fantastic Flying Books of Mr Morris Lessmore came to be. Joyce spoke of his long association with Bill Morris and Coleen Salley and the long journey to the final film and now, finally, book. Many tears were wiped away and it was truly a 'moment'. The short film was shown on while we talked and nibbled on cake. Tribute to Bill Morris and Colleen Salley. Justin Chanda (S&S) introduces William Joyce. Sets and storyboards from the film were on display. You can see how wonderful they are. The room was so full of amazing people. Here's one of my favorites - Ellen Hopkins, best selling mutiple multiple times YA author. If you've read some of my blog posts you may remember I attended the Nevada SCBWI mentor programme organized by Ellen Hopkins and Suzy Morgan Williams a couple of years ago, so this is all their fault ;-). Ellen has the best smile and I am proud to know her. As you can see we had a pretty, darn good time. A magical evening with magical people and one to recall when alone in the studio struggling with a layout or story and in need of inspiration. Most embarrassing moment of the evening: singing 'The Black Hills of Dakota' to Jon Anderson, head of Simon and Schuster's Children's Books. Look, he wasn't wearing a tag and we hadn't been introduced! Jees. Well, I guess that's any career I wanted with S&S right out of the window. It was probably all that sugar I ate .... thanks for being a sport Jon and not having me removed from the party ;-). Back on the exhibition floor next day, there was Loren Long, large as life and twice as handsome, signing his new book Nightsong. It's GORGEOUS. Got to be a Caldecott contender. Just saying. He deserved a bigger table. Prowling Houghton Mifflin Stand (really?) was Ms. Maggie Steifvater. (Shiver, Linger, The Scorpio Races). I totally admire Maggie ... and her amazing blog. I begged for a pic (isn't she so photogenic?). I also had a chat with her about her recent visit to the UK ... she travelled through my neck of the woods (Yorkshire) and it turns out she used my hometown and the surrounding beaches and cliffs as some inspiration for 'The Scorpio Races' ... amazing! She knew the cliffs I used to paint in art college. So I got 'Scorpio Races' as soon as I got home and reading now. Isn't it a small world? Look!! It's Nathan Hale! Funny and talented and generous. And ... I was lucky enough to get a Nathan Hale original ... and it is not going on ebay. Couldn't resist posting Olivia again. TOO SWEET! I want a character that comes to life and walks around at exhibitions being harassed by strange women. My best moment of the whole shebang happened by chance in a crowded elevator. Typically I was not at my best, (SIGH) having just been for a swim, wrapped in a dripping sarong and bathing suit and with people trying not to come in contact with me. As the elevator emptied (no doubt folks leaping off at any floor to avoid the wet person) I was left in one corner, dripping quietly, and with two guys in the other corner (as far away as possible from me). And then I realized omg, OMG, - that's Brian Selznick! To speak or not to speak? I gibbered and stuck out a damp hand and gabbled something about how much I admired and loved his work and possibly dropped a curtsey. (We Brits are trained from birth). Brian was lovely and thanked me (and even shook my clammy mitt) and introduced me to his partner. I staggered out at my floor and collapsed in ecstasy on my bed. These are the things that make a trip memorable. And it was just that, the whole thing, memorable! Roll on ALA 2013! I also hugged Dan Santat, but no photo to prove it, or sell on ebay. ALA ... just what I got up to last weekend. I got to tell you, ALA was cracking! It was my first visit to a BIG library conference and it was so much more than I expected. I expected to see a LOT of librarians, a LOT of BOOKS and SOME amazingly awesome people. What I didn't expect was to feel totally at home, surrounded by thousands of people who love books, LOVE them I tell you! If you have never attended ALA, summer or midwinter conference (and you can afford it) ... go! Just for the experience. If you're an illustrator, a writer or a reader I say GO! Get involved. Meet the librarians ... meet the publishers ... meet the famous writers and artists! (And the not so famous!) Go to panels and readings and presentations. Buy a ticket to the Newbery/Caldecott Banquet or the Coretta Scott King Awards. You won't regret it. OK .. so my trip was fat ... got to Anaheim, CA Friday night (from Maine), back on the redeye, Sunday. My lovely roomie from last year's SCBWI summer conference (and LA resident) Charlene Ellen (MG author in waiting) collected me at the airport. (Thanks Charlene!). We stayed at the Hilton Anaheim ... excellently situated right next to the conference centre, so you could nip back and forth to the hotel during the day. And there's the swimming pool that the kid pooped in just after I got in. Yuk!!!! No, really, it was a great hotel. Despite the toilet blockage. (I blame Charlene). Pretty nice to get an exhibitor's badge too! Felt like a pony at a show. (No comments from the cheap seats, thank you). I had a book signing with Kane Miller and also with Charlesbridge on Saturday .. pretty overwhelming for a first timer. Saturday morning - straight into the fray with 'All Star Cheerleaders' at Kane Miller's booth. This was the first time I'd met Anastasia Suen (author). She was busier than a bee with umpteen signings and panels. We got to work and suddenly there's a queue of librarians and we're signing like mad things! I'd elected to draw a quick cheerleader in every copy ... and we did 100 in an hour. What was I thinking?? My hand nearly fell off. But, it was a great experience and the first time I'd experienced anything like that before! Lunch was a welcome break ... and then it was back into the conference hall and a signing on Charlesbridge for the book 'Hidden New Jersey' by Linda Barth. The pace slowed down a little and there was time to talk to the people buying the books! Here I am with Charlesbridge author Caroline Arnold, on the schedule after me. In the evening we hired a Hummer limousine and hit the town! We did get to go to Simon and Schuster's Celebrate the Picture Book Dessert Party (kindly invited by Ashley Bryan) that evening, in the neighbouring hotel. It WAS all kinds of awesome and I'll tell you more about that in post TWO. Sunday morning .... up early to attend the Corretta Scott King Awards. I decided I wanted to go to the breakfast to see Ashley Bryan receive his Virgina Hamilton Lifetime Achievement Award. I was lucky enough to visit with Ashley last year at his studio on an island in Maine. It was an honour to see him receive it. Ashley's love and humanity shone out and was returned by the appreciative audience, I of course, blubbed (I always do). Also honoured were Kadir Nelson, for 'Heart and Soul', Shaun W Evans (among others) and Leo Dillon, sadly no longer with us. It was a wonderful couple of hours ... singing and music and a fab brekky too! I sat next to a great bunch of librarians. That's one of the things that struck me about the whole weekend ... out of my usual comfort zone of illustrators and writers I expected to feel a bit isolated. But everyone was wonderful and conversation flowed. Of course it did! We all love books! Here is Ashley signing copies of his books for invited children attending the breakfast awards. What a great memory for them! By 3pm I was pretty tired ... but two more hours until close. So I grabbed some caffeine and a sugar hit and back to the stands ... it was SO worth it. Nothing to do after that other than get some dinner, catch up on email. And fall asleep on a sofa in the hotel lobby until the shuttle came ... I think I was alseep before the plane even took off. In my next post ... just WHO I accosted at ALA and a look at the Simon and Schuster Dessert Party. (Why sugar and children's books are the perfect match). 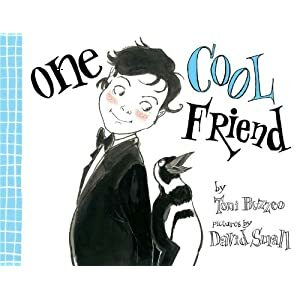 This week I made it to the always informative and interesting blog owned by Simon and Schuster illustrator Debbie Ohi. Debbie's new book 'I'm Bored' (by Michael Ian Black) will be published in Fall 2012. In this post I talk about the process I used to create the retelling of the book 'THE UGLY DUCKLING' using Utales.com software.